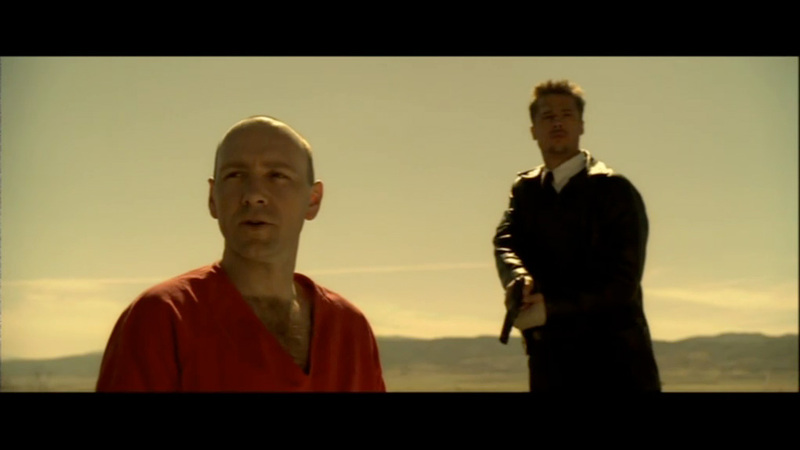 I was living in Korea when I first saw Seven (or Se7en, as it is sometimes pretentiously stylised). The print was dark so I couldn’t make out very much, and the sound in the cinema was appalling. I could barely hear the dialogue over the noise of incessant rain. My initial thought was that the film was interesting, and obviously had some clever notions behind it, but not much more. I watched it on video a year later and appreciated it far more. It was far longer than I remembered; as well as showing dark and scratchy prints, Korean cinemas had the annoying habit of bluntly chopping off arbitrary scenes from movies to reduce the running time, so when I got to see the film in full, I could watch all that I had missed. I have since seen it several times, and just recently I watched the beautifully restored blu-ray, which allows you to see how well-lit and artfully composed each frame is. This is a film dealing with a horrific subject, but it’s hard not to be in awe of the craft with which it was put together, even when some of that craft is grisly make-up and gore. The screenplay is by Andrew Kevin Walker, and it may be one of the most jaded scripts ever written. The subject is sin; Walker thinks we’re all guilty and bereft of hope, and wants to shove our noses in the dirt to prove it. He also wrote the very dark 8MM: perhaps the guy needs to spend some time in the sun. It’s worth pondering if Seven would be made the same way today. It seems very much of its time; it has a fin-de-siecle feel of something depraved created at a time of decadence; an exquisitely detailed, lavishly mounted morality play. 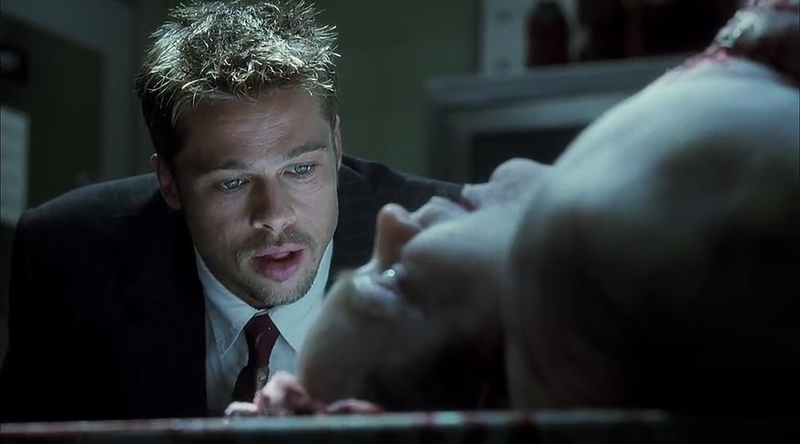 The film has only a few light moments: when the passing subway rattles the apartment, and Freeman, Pitt and Paltrow laugh uncontrollably; when Pitt uses Cliff Notes to Dante; and when Pitt pronounces de Sade as “de Sha-day”. But they are few and far between; this is a dark, dark film. 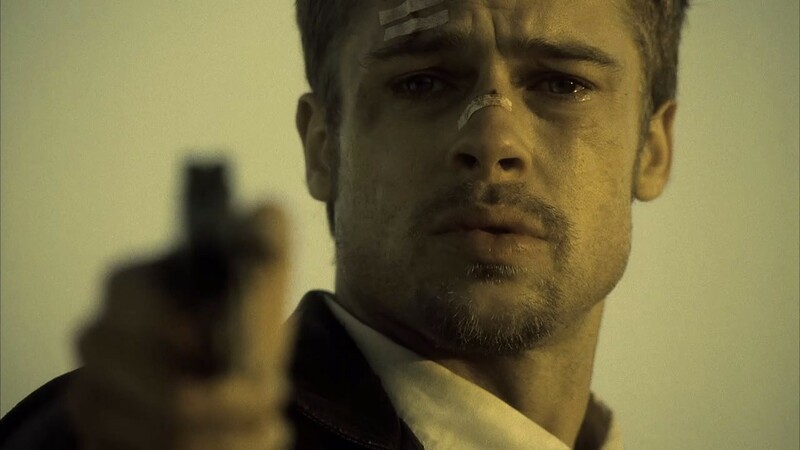 It rains almost throughout the film until the last day when the sun comes out, which is deceptive on the part of the film as it still has a downbeat ending, an ending that director David Fincher and the cast fought the studio to keep. Morgan Freeman offers a little – just a little – consolation when he tells his boss that he’ll be around, and then quotes Hemingway at us. I think the quote feels tacked on and unnecessary. Still, though, this is one of Freeman’s better performances. He’s old, weary, he’s seen it all, and he moves slowly, not just because he’s a careful cop, but because the city has worn him down. As for Pitt, this is perhaps his best early work. He’s punchy, angry, boyish, cocky. The relationship between him and Freeman is well-written and well-played; it breathes life into a stock situation (old wise cop & young aggressive rookie). Paltrow also is very good. It’s easy to mock her these days – the conscious uncoupling, the air of privilege, some rather silly statements about the world – and forget that she was once a young actress with enormous talent. She’s only in a couple of scenes, but she holds the screen like few actresses can. She and Pitt were dating at the time, and the chemistry is obvious. And then there’s Kevin Spacey. Spacey had done psychotic before (on the TV series Wiseguy), but by the time Seven came along, we’d had a raft of smart serial killers (thanks to Silence of the Lambs). How does an actor distinguish himself in a part that could have been cartoonish? Spacey opted for a still, quiet performance, delivering his verdict on the world in the back of the police car. That scene still holds up as one of the best written, best acted scenes in a Hollywood movie from the last twenty years. The amazingly tense scene that follows is edited brilliantly. All that said, though, I`m still not sure if this is a film with which I can fully engage. I can admire it tremendously, of course, and I do. But there`s something curiously alienating about it, in spite of Pitt`s energy, Paltrow`s warmth, and Freeman`s wisdom. In a similar way, I’m in awe of Picasso, but I don’t know that I like his paintings very much. Is it because of the sickly greenish hue that saturates most of the film? Is it the endless rain? Or the unbelievably depressing score? The filmmakers would probably have you believe it’s a tough film to watch because you may see yourself reflected in one of the seven sins being punished. There’s something very dubious – or perhaps very clever – about a film that, in spite of beautiful music by Bach, Charlie Parker, Thelonius Monk, and Billie Holiday on the soundtrack, makes you want to take a long shower afterwards. … very well written. Seven is definitely one of the best films i’ve seen. tho i don’t think the viewer necessarily has to feel they have to relate to the sins, as for me the way the victims were murdered were so over the top gruesome that it is as if they are pointing a finger at society’s sins rather than that of the individual, if that makes any sense. yes, the movie is dark and heavy and crushes you at times, but definitely the art of it, the beauty of the darkness, even though horrifying, is what draws the viewer in; the psychology of it, the inner turmoil of the hunter and the hunted. the need to understand, the need to be understood, the need to express, the need to release, the need to free that which is not necessarily caged… and yet maybe we do not even realize we are. reminds me of the lyrics by Smashing Pumpkins, “despite all my rage i am still just a rat in a cage” (bullet with butterfly wings). i am talking in circles here but that’s the thing with this film, you fall deeper into the abyss the more you think about it. 😊 i do think it is excellent. Good review Niall. Love this movie so very much. That twist at the end still gets me. Each and every damn time I tell you. As someone who once came across some very similar scenes in his everyday job, I can only applaud the staging, and make-up of the grisly death scenes. They are near-perfect. The blood is done just right, just congealed, and dark enough. And in the right amounts. The scene with the dead fat man is so amazingly correct, if you close your eyes, you can almost smell that room. The wounds are just at the right stage that you might find, and the whole thing just screams authenticity. Believe me, it does. I care less about the script, and even less about the (for me) forgettable performances of Pitt and Paltrow. Spacey makes the film, together with the set-designers, and make-up team. It is far better than it ever got credit for. definitely, yes. and well said. Great review Niall. Spacey proves why he is such a believable character. An amazing script. This was the film that Pitt started showing some chops in. It got stellar reviews on release in the UK Niall. It was the ‘must-see’ film at the time, and as far as I know, everyone loved it. Almost everyone I know owns the film on DVD, and it is considered a classic in the genre. Cheers, Pete. yes, it definitely is an essential of the 90s, and definitely needs to be seen … but as I said, there’s something for me that keeps me at a distance from it, but i can’t put my finger on it. Haha I saw Kalifornia after Seven and I was blown away by Kalifornia, which was shot before seven. He’s a guy I wouldn’t mind grabbing a cold one to pick his brain and see how he ticks! It may be that Seven is far closer to being ‘real’ than other similar movies. It does feel like this could happen to you, it is part of its success that the three main characters seem like very real people in an impossible situation. And only one of the three is clearly in control of what will happen next. The other two believe they are in a position of power but in fact they have no say over what will happen to others or themselves. A very well written review and pretty spot on about the nature of the film. I first saw it in when I was in college and I thought it was one of the most well-acted, creepy and interesting films I had seen and it was one of the films that really got me into the thriller genre. I really have to check it out again because its been a good few years since I saw it last and I want to know if it is as good as I remember. Very well written piece. I very much agree with your thoughts, especially as they pertain to the scene in the back of the police car and how spectacular it was. Whenever I watch the film I get shivers down my spine. This is the flick that really brought it home for me when it came to Brad Pitt and, most importantly, Kevin Spacey, who clearly stole the show in just a few minutes of screen time. Like you, I appreciate the film for its artistry, some of its dialogue and the very good performances. However, my problems with it are not necessarily with its oppressive, downright tragic aura, but rather with its very methodical and conscious slowness. In fact, I remember the scene where both Freeman and Pitt fall asleep waiting for results from the lab as one that was indicative of how slowly the crime solving was unfolding. This is not to say I wanted things to develop fast, but there was just not enough for me to hold on to before the relationships began to unfold and Spacey came into the picture.